I’ve been reading Hannah Sullivan’s The Work of Revision, and really enjoying it. Here are a couple of excerpts from her chapter on T.S. 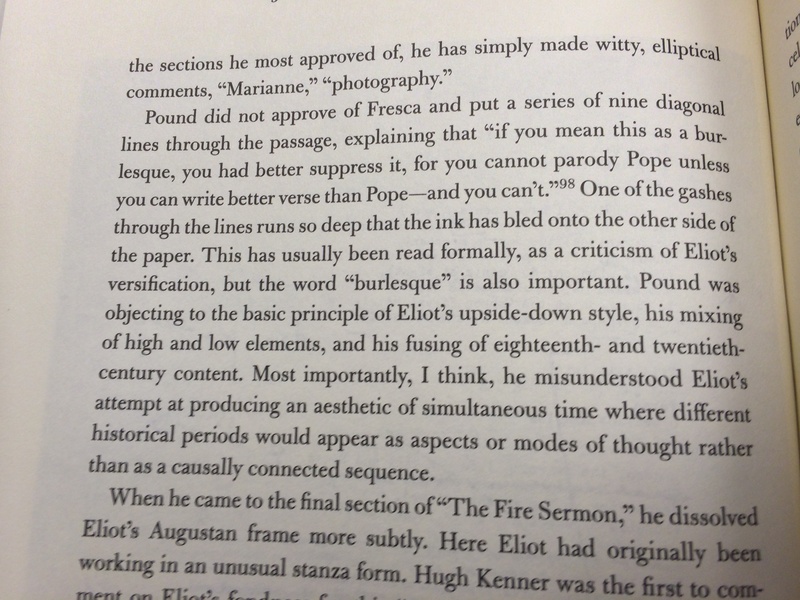 Eliot’s The Waste Land, centering on Ezra Pound’s editorial input on the poem. 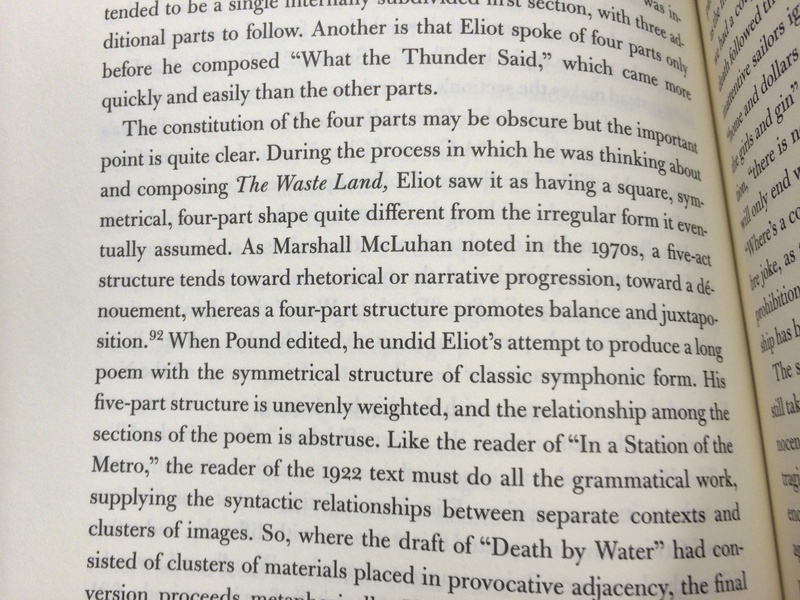 She makes a good case that Eliot’s style of revision indicated a profoundly different aesthetic than the excisive revisions that Pound (apparently vigorously) put forward. It’s a bit of a counter-narrative to the story of a team-up; rather Pound’s revisions antagonized Eliot’s original vision, creating a poem somewhat apart from both of them, but perhaps more in Pound’s camp. A re-post from the Preserving Games blog, October 22, 2009. A re-post from the Preserving Games blog, October 19, 2009. A postmortem “designates a document that summarizes the project development experience, with a strong emphasis on the positive and negative aspects of the development cycle.” After reviewing the literature discussing problems present in the software industry, the authors begin to analyze the problems described in the postmortems. The games covered and the problems identified and quantified are in a table that describes the number of occurrences and overall frequency (click for larger image). Note: sometime in the future (the Web 3.0 future?) I would provide a link to the actual dataset rather than a .PNG showing you a picture of the dataset. The authors’ categories provide a helpful navigation to the issues that arise in a game development project. As they note, this study sees the most cited problems as unreal or ambitious scope and features creep, both constituting 75% of all problems described. Notable for game archivists is a 40% frequency for the lack of documentation problem as well. The authors note low occurrences for crunch time and over budget (25%), both “said to be ‘universal. '” It’s difficult however to draw expansive conclusions from a small dataset. Moreover postmortems were not team projects or collaboratively written, rather a single participant is responsible for the postmortem. The authors usefully provide other limitations to put the data in context. 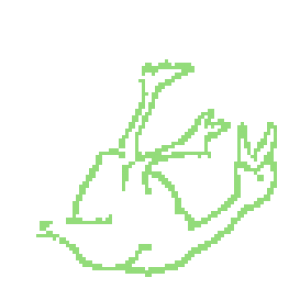 On a final note, the postmortems are still available at Gamasutra, and they are really fascinating reads. It becomes clear just how young an engineering and creative discipline digital game-making is, and how much fluctuation there is in how a game turns out. There are some great examples and stories there; the authors of this article cite quite a few of them. The Producer-Archive Workflow Network (PAWN) is a platform for handling the ingestion of artifacts into a long term digital repository like Fedora of DSpace. As such it focuses on the Producer-Archive interaction portion described in the Open Archival Information Systems [pdf]. It strives for flexibility in accommodating different producer-archive relationships, most likely found in a distributed system. For example an archivist or repository manager may use PAWN to handle disparate types of data or package producers (manufacturers, individual scholars, students, etc.) who are all going to have different metadata to fill out before submitting the package for ingestion, and for which the processing may be different in regards to individual metadata elements. PAWN is part of a larger tool set being developed by ADAPT (An Approach to Digital Archiving and Preservation Technology). PAWN seems most applicable in a distributed repository that sees submissions from a variety of different producers. It’s unlikely the Goodwill Computer Museum would need such flexibility for its own repository. That repository will be fairly centralized, only maintaining multiple clients in the building (and perhaps a few remotely in time). Our producers will always be staff or trained volunteers. But the project does highlight that the museum will be seeing submissions from at least two different ‘producers’: the recycling department, individual donations, and perhaps institutional donations. The recycling department ‘producer’ effectively makes the real producer anonymous. The only exception would be provenance information found on or in the artifact itself (stickers, names in books, disk storage, etc.). Despite the presence of such information, I can’t imagine the museum would be able to use it, as very likely it is outside of the recycling departments’ right to disburse such information.